Do you have any Hunger Game fans for friends? I do, and her birthday is right around the corner. 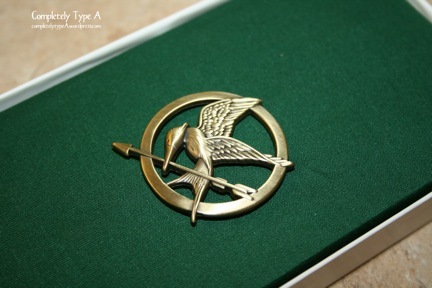 I found this mockingjay pin on Amazon for $4.99. I’m sorry to say when I just checked, the price has been raised to $14.99. Lame. Anyway, to jazz it up a bit I used an old department store jewelry box and added the infamous saying on the front and a little green fabric on the inside. She’s gonna dig it.